The sports day was held on the 16th of November 2000. The chief guest was Mrs. Shahida Jamil. The primary students presented the bouquet and Maha Kausar, Head girl, Cambridge Section, welcomed the parents, teachers and Mrs. Jamil. The High School and Cambridge Section, each bearing their House colors marched past, followed by a singing of the National Anthem. Cambridge and Metric prefects took the oath, and the torch was lit. The games were then declared open. The games commenced with flat races of classes I, II, III, IV and V. Children of classes I and II did an exercise and dance routine, followed by the relay race, three legged race, a marble and spoon race, a potato race, and a drill display, all by Primary students. The classes VI, VII, VIII, IX, X and XI had their flat races. There was a drill display by the Middle school and Cambridge section, classes VI, VII, VIII. Class IX had their sack race, followed by a 3 legged race, a skipping race, a sack race and obstacle race. There were two more relay races before the Fathers, Mothers and Teachers race.  The ex-students were not excluded; they also had a tug of war with the Council members. There was a second March formation display by the Cambridge and Metric students. Our principal Sister Julie Pacheco called out the O level results of the school and Rabia Shakoor who achieved the highest grade in Art in Pakistan, was given a medal. Mrs. Jamil and Sister Julie handed out the prizes, followed by a speech by Mrs. Jamil. 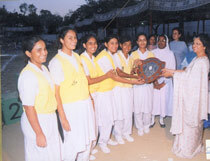 Urooj M. Khan of the Metric Section was given the athlete of the year award, and Yellow house was given the best house and best march past award. Urooj was given first prize for winning the Javelin and discus competition. Mariam Asif won the shot-put prize. There was a vote of thanks by Anousha Atezad and the sports day ended with a singing of the School Song.